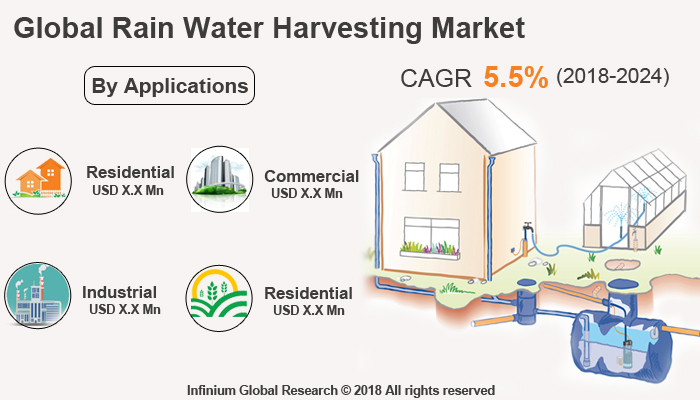 A recent report published by Infinium Global Research on rainwater harvesting market provides in-depth analysis of segments and sub-segments in global as well as regional rainwater harvesting market. The study also highlights the impact of drivers, restraints and macro indicators on the global and regional rainwater harvesting market over the short term as well as long term. The report is a comprehensive presentation of trends, forecast and dollar values of global rainwater harvesting market. According to the report the global rainwater harvesting market is projected to grow at a CAGR of 5.5 % over the forecast period of 2018-2024. Rainwater harvesting is the technique of building and storage of rainwater to reuse it for landscape irrigation, domestic use, and many other usages. In this system, the rainwater is collected from the rooftops and/or other manmade aboveground hard surfaces including well, shaft, or borehole and it will store into natural reservoirs or tanks. The rainwater harvesting helps to improve the water supply and food production by providing high-quality water for both drinking and farming applications. The rapidly increasing demand for usable and clean water across all over the globe drives the growth of rainwater harvesting market. As the world population is increasing the demand for freshwater is also growing. The harvested water is mainly used for irrigation and the drinking purpose. The water stored during the rainwater harvesting is the best suitable alternative to a distributed water source. In addition, robust applications of harvest water across various sectors including agriculture, industrial, residential and domestics are likely to anticipate the growth of the rainwater harvesting market. However, growing wastewater treatment plants are hampering the market growth of rainwater harvesting. The trending application of rainwater harvesting for the groundwater restoration is expected to contribute to the growth of rainwater harvesting market. Moreover, the rainwater harvesting system offers various benefits such as efficient use of natural resource and reduced flooding, reduces the need for imported water, stimulates energy and water conservation and many others. Harvest water is an excellent source of water for landscape irrigation, with no chemicals such as fluoride and chlorine, and no dissolved salts and minerals from the soil that is projected to create several opportunities for the rainwater harvesting in the agriculture sector. Geographically, Asia Pacific holds maximum market share in the rainwater harvesting in 2017 and expected to be the dominating region over the forecast period. The growing adoption of rainwater harvesting system in the hotels, malls, hospitals, and other end-use applications are driving the growth of rainwater harvesting market in the Asia Pacific. Furthermore, rapidly rising awareness about water conservation and the importance of rainwater harvesting in the Asia Pacific region are likely to escalate the growth of rainwaters harvesting market in upcoming years. The report on global rainwater harvesting market covers segments such as method and applications. On the basis of the method, the global rainwater harvesting market is categorized into above ground and underground. On the basis of applications, the global rainwater harvesting market is categorized into residential, industrial, commercial and agriculture. The report provides profiles of the companies in the global rainwater harvesting market such as, Kinspan Group , Graf Group, Innovative Water Solutions LLC, Rain Harvesting Supplies, Inc., Water Field Technologies Pvt. Ltd., Climate Inc., Heritage Tanks, The Gulf Islands Rainwater Connection Ltd., WISY AG, Watts Water Technologies, Inc.. The report provides deep insights on demand forecasts, market trends, and micro and macro indicators. In addition, this report provides insights into the factors that are driving and restraining the global rainwater harvesting market. Moreover, IGR-Growth Matrix analysis given in the report brings insight into the investment areas that existing or new market players can consider. The report provides insights into the market using analytical tools such as Porter's five forces analysis and DRO analysis of rainwater harvesting market. Moreover, the study highlights current market trends and provides forecast from 2018-2024. We also have highlighted future trends in the rainwater harvesting market that will impact the demand during the forecast period. Moreover, the competitive analysis given in each regional market brings insight into the market share of the leading players. This report will help manufacturers, suppliers, and distributors of the rainwater harvesting market to understand the present and future trends in this market and formulate their strategies accordingly.